I’ve been working at home since 1998 and blogging about it since January of 2006 (though I really should have started this blog earlier). When I did finally decide to write about it, I chose a domain name and installed WordPress as my blogging platform. Since then, it seems I suffer from restless WordPress theme syndrome (hereafter known as RWPTS). In case you didn’t notice, I’ve changed things up again! When I first started this blog, I didn’t really put a lot of time or effort into the looks of things beyond finding a theme I loved and tweaking it with my own images. 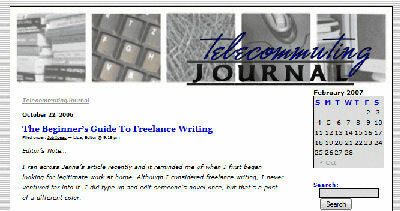 Back then, this blog looked like this . . .
Then, a couple years ago, I decided I needed to update the look of my site by finding a more versatile WordPress theme. I found one, tweaked it all to pieces, and was happy. I liked having the internal page layout different from the front page, but I didn’t like having to maintain them. Still, I loved the new theme and figured I was going to stick with it for years and years. At the beginning of 2008, Telecommuting Journal looked like this . . .
I’m very happy to have the fresh look and the fresh new layout, and I’m really hoping my RWPTs won’t flare up again until at least the fall of 2011! I love to get feedback on design issues – so I’ll also mention that constructive criticism is welcome, mean remarks are ignored and SpAm is always deleted! I’m impressed you have time to have RWPTS! But I know what you mean. I find it is difficult to commit to a look because then something else seems to work a little better. It’s fun but time consuming. I like the balck and white header. It’s crisp. .-= Michele´s last blog ..Sick kid = little work =-.